1 of 1 Place cola, ketchup, vinegar, onion powder, garlic powder and black pepper in a medium-size saucepan. Simmer until sauce is reduced to 1 cup, about 20 minutes. Take off heat and reserve. 1 of 3 Heat gas grill to medium-high or coals in charcoal grill to medium-hot. Lightly coat grill rack with oil or cooking spray. 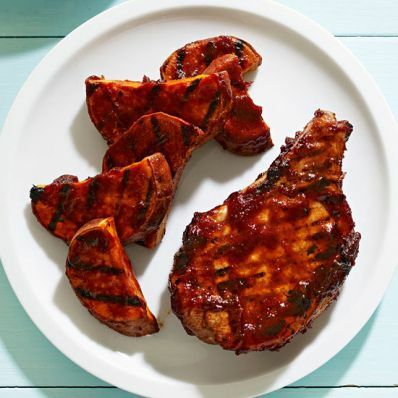 2 of 3 Grill pork chops and sweet potatoes 4 minutes per side; generously brush both sides with 3/4 cup of cola sauce and grill additional 2 minutes per side. 3 of 3 Serve pork chops and sweet potatoes with remaining sauce, if desired.